Q: “ I likely would have physical DVD with a Video_TS folder (both video and audio files in the folder) or possibly just the Video_TS folder transferred on flash drive or something. I would be able to preview a DVD on my Mac. Frankly, not sure if I could actually open and somehow preview the contents of TS folder if I just transfer to hard drive from a flash drive. I just don’t off hand know how. A: This is a very misunderstood process and most people find it annoyingly cumbersome. Here is what I have found out to be the easiest solution to directly copy DVD to Video_TS files for store on hard drive and ripping and converting DVD to propress 422 for Final Cut Pro Editing on Mac. (or the newer but more expensive Final Cut Studio) or any other Mac editing program. For lossless Blu-ray coping on Mac, Pavtube BDMagic for Mac can lift your bother to the full. (Read review). With it, you you can copy the latest commercial Blu-ray to hard drive keeping exactly the original file structure without anything changed. Besides, by rolling off the disc protection, all commercial protected Blu-ray movies can be ripped to nearly all popular video and audio formats like MP4, MOV, MKV, WMV, AAC, MP3 as you need for playback on different media devices. 1. Launch the Blu-ray/DVD copying software. Click the BD disc button to load your Blu-ray/DVD. The Blu-ray titles and chapters will be listed on the program within a few seconds. 2. Click “Browse” button to select a destination folder for the output files. And click “Copy the entire disc” button in the main interface to starts copying the Blu-ray disc on Mac OS X maintaining the original structure menu. As soon as the copying task finished, you can click “Open” button to locate the Blu-ray directory. The decrypted Video_TS folder contains all information and contents in the original disc. Among them, the BDMV folder is the most important one with audio and video files in it. Open BDMV -> STREAM folder and you will find all the .m2ts movie clips. You can play these M2TS videos on Mac or have a further conversion and transfer to your Hard drive. Tips: If you want to Import your DVD Video_TS files to Final Cut Pro for Editing, you can choose Apple ProRes 422(*.mov) as output format. 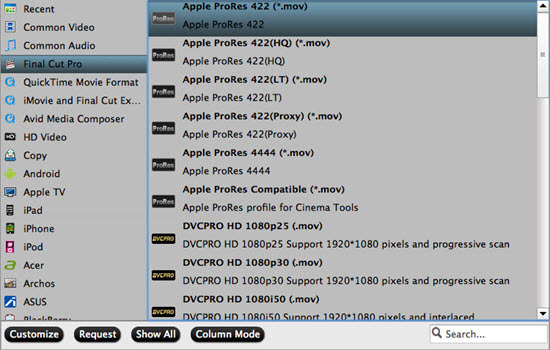 Here, Click on the drop-down list of “Format” to select “Final Cut Pro > Apple ProRes 422 (*.mov)” as output format.